When I was in India last year (Chennai – previously known as Madras) I had a cheap Chettinad chicken dish on my last night from a take-away restaurant in a local non touristy area (aka Koli Milagu Masala = Chettinad Pepper Chicken). The guesthouse owners got it for me as it was not deemed safe to wonder around that particular area near the airport (for my early flight back to Sri Lanka) as a white woman alone after dark. Happy to be waited on and enjoying a couple of beers from the fridge in the reception area downstairs I relaxed until my food arrived. I had not expected much, having enjoyed the food on offer in 4* establishments in the city and after surveying the urban, dirty, market area where I was to spend my last night. Not only was the portion enormous so great value for money regardless of taste but when I did taste it I was blown away. Not just by the spice of the dish (if you don’t like pepper or chilies I’m afraid this food is not for you) but it was delicious and the flavours wonderfully balanced. It was easily one of the best curries I have ever had, and I have had a few. I had it with naan bread and finished the lot! I have since been on the look out for a good recipe that does not involve too much work as the original-style recipes I found all involve the grinding of spices yourself – you will need a spice grinder and blender for this recipe. Below is one of the best I have found so far. 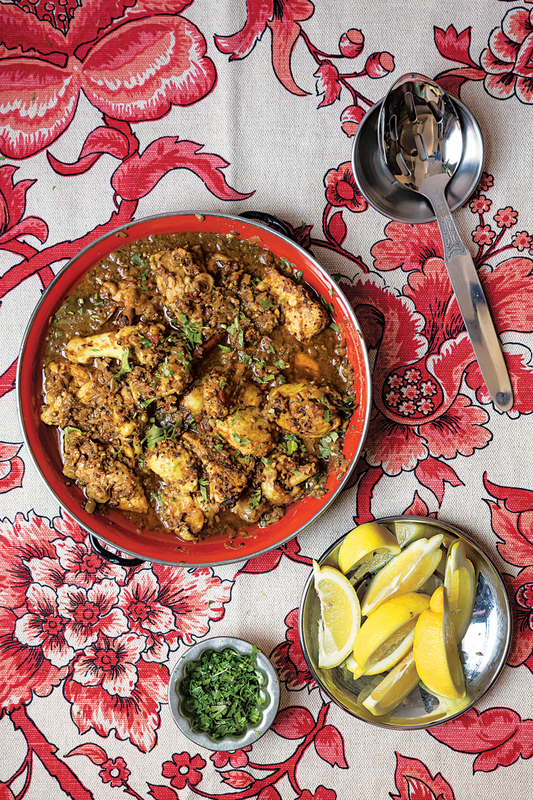 This spicy chicken recipe is adapted from one in Madhur Jaffrey’s classic Flavors of India (West 175 Publishing, 1995). It is flavoured with fennel seeds, curry leaves, and urad dal, the skinned split black lentils that are a popular ingredient in southern India. It serves four. Some chopped coriander leaves (for garnish). Make the spice paste: In a small frying-pan, heat 1 tbsp of the oil over a medium- high heat. When hot add the cumin seeds, chillies, coriander seeds, fennel seeds, black peppercorns and poppy seeds. Stir and fry briefly until lightly roasted. Now put these into a spice grinder and grind to a powder. Empty into the container of an electric blender. Put the garlic, ginger, turmeric and salt into the blender as well, along with 6-8 tbsp of water. Process until you have a fine paste and then set aside. Heat the remaining 5 tbsp oil in a large saucepan over a medium-high heat. When hot, add the bay leaves, cardamom pods, cinnamon, fennel seeds, cloves and urad dal. Stir and fry briefly until the urad dal turns red, then add the curry leaves if using. Stir once or twice and add the onions. Fry the onions until they are soft and just lightly coloured. Now add the spice paste. Continue to stir and fry for about 4-6 minutes, adding a little water to prevent sticking. Add the tomato. Stir and fry for a further 3-4 minutes. Add the chicken pieces to the onion and spice mixture. Stir until they are well coated, then add 600ml/1pt/2 cups of cups water, just enough to cover. Bring to the boil. Turn the heat to low, cover and simmer until the chicken is almost cooked, about 20-25 minutes. Using a slotted spoon, remove the chicken pieces. Turn the heat up to medium- high, and reduce the sauce until very thick. This should take about 6-8 minutes. Replace the chicken, fold gently into the sauce and cook for a further 5 minutes before serving. Garnish with coriander leaves. Serve with rice, naan, paratha or idly appams.